Produced with Sangiovese and a small amount of Malvasia Nera, Colorino and Merlot, it is characterized by a balance of elegance and complexity, which make this wine a magnificent example of the "terroir". Location of vineyard: Fonterutoli: 450 m. (1,476 ft.) a.s.l. ; west - southwestern exposure, Belvedere: 300 m.(920 ft.) a.s.l. ; southestern - southwestern exposure. "Jeannie Cho Lee" has rated the wine "Mazzei Castello di Fonterutoli, Chianti Classico Gran Selezione DOCG, Italy" from the vintage 2009 on 25.11.2012 with 85 of 100 points.
" Well made Chianti with fresh cherry flavours. Vibrant, easy to enjoy, balanced Chianti for everyday drinking. Tasted in: Hong Kong, China. Maturity: Drink. " 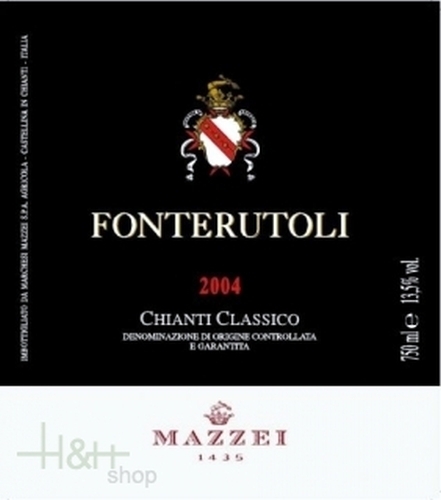 "Jeannie Cho Lee" has rated the wine "Mazzei Castello di Fonterutoli, Chianti Classico Gran Selezione DOCG, Italy" from the vintage 2007 on 01.05.2010 with 87 of 100 points.
" A fruity, medium bodied wine with good intensity and depth of flavours. 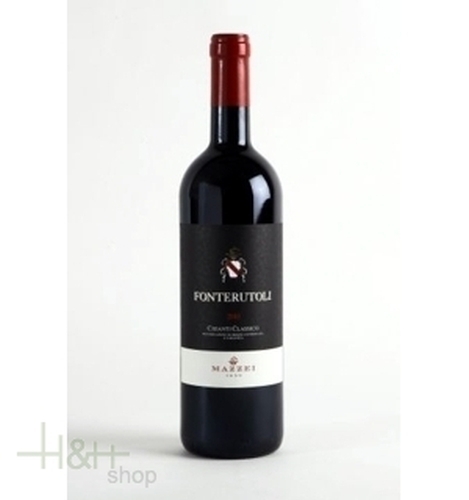 This wine offers everything that an Italian red wine lover will appreciate - ripe fruit balanced by savoury, earthy characters and firm tannins with that lovely dark cherry Chianti fruit. Tasted in: Hong Kong, China. Maturity: Drink. " "Luca Gardini" has rated the wine "Mazzei Castello di Fonterutoli, Chianti Classico Gran Selezione DOCG, Italy" from the vintage 2013 on 01.04.2017 with 90 of 100 points. "Falstaff Magazin" has rated the wine "Mazzei Castello di Fonterutoli, Chianti Classico Gran Selezione DOCG, Italy" from the vintage 2013 on 10.02.2017 with 91 of 100 points. "Decanter World Wine Awards" has rated the wine "Mazzei Castello di Fonterutoli, Chianti Classico Gran Selezione DOCG, Italy" from the vintage 2013 on 01.01.2017 with 95 of 100 points. "Wine Spectator" has rated the wine "Mazzei Castello di Fonterutoli, Chianti Classico Gran Selezione DOCG, Italy" from the vintage 2012 on 31.10.2016 with 90 of 100 points. "Luca Gardini" has rated the wine "Mazzei Castello di Fonterutoli, Chianti Classico Gran Selezione DOCG, Italy" from the vintage 2012 on 01.07.2016 with 95 of 100 points. "Falstaff Magazin" has rated the wine "Mazzei Castello di Fonterutoli, Chianti Classico Gran Selezione DOCG, Italy" from the vintage 2011 on 12.02.2016 with 94 of 100 points. "Wine Enthusiast" has rated the wine "Mazzei Castello di Fonterutoli, Chianti Classico Gran Selezione DOCG, Italy" from the vintage 2012 on 06.01.2016 with 92 of 100 points. "Wine Enthusiast" has rated the wine "Mazzei Castello di Fonterutoli, Chianti Classico Gran Selezione DOCG, Italy" from the vintage 2014 on 06.01.2016 with 88 of 100 points. "Luca Gardini" has rated the wine "Mazzei Castello di Fonterutoli, Chianti Classico Gran Selezione DOCG, Italy" from the vintage 2011 on 01.07.2015 with 92 of 100 points. "Wine & Spirits Magazine" has rated the wine "Mazzei Castello di Fonterutoli, Chianti Classico Gran Selezione DOCG, Italy" from the vintage 2010 on 01.04.2015 with 91 of 100 points. "Wine Enthusiast" has rated the wine "Mazzei Castello di Fonterutoli, Chianti Classico Gran Selezione DOCG, Italy" from the vintage 2011 on 09.01.2015 with 89 of 100 points. Born in 1845 after a secret recipe never disclosed, up to today kept by the family and unchanged with time; it is, in fact, a case history in the trade. Always referred to as 'the digestive', it is the perfect drink to those who enjoy extending an evening's pleasures. Cynar is an artichoke based bitter. Its distinctive flavour is enriched an infusion of 13 herbs and plants, making it a completely natural drink, rich in scents and a unique taste . It perfectly conserves all the health properties of the ingredients used in its preparation. Only moderately alcoholic (16.5%) Cynar is a modern and versatile drink that is always welcome.